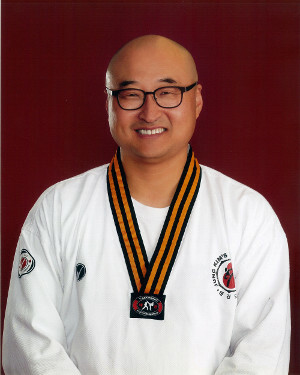 Welcome to Jung Kim's Martial Arts! I welcome you to the website for Jung Kim’s Taekwondo. Taekwondo is a martial art originating from Korea, it means ‘kick, punch, the way of life’ but it truly means more than that. The study of taekwondo will develop a harmonious spirit that affects all aspects of your life. At our school, children and adults train their minds, bodies and spirits. Our students learn to show respect and honor, to be humble, honest and develop a strong self-confidence. You will develop coordination, balance, strength and flexibility. Whether your goal is to get in better shape and lose weight, self defense, or to train for competition in this Olympic sport, we have classes for you. Please call us! We would like to meet you and have you come watch one of our classes. Master Kim's instructors are highly-disciplined, well-trained black belts who have a strong desire to teach martial arts correctly. Teaching focuses just as much on character development as on physical training. Master Kim's first goal when teaching children is that he wants them to not only be great while doing Taekwondo, but he wants them to succeed in life.